The legends were true! Somewhere high in the clouds, human beings have again set foot on the floating island of Laputa, for centuries a peaceful, parklike ruin, tended only by its silent, faithful robots. But just behind Pazu and Sheeta are soldiers from the aerial dreadnought Goliath-who have captured Dola and her pirate crew, and are now looting the gold and jewels of the Castle in the Sky for themselves! But the man who guided them there, Muska, has his eyes on power, not money-and he alone knows how to activate the castle's ancient superweapons that could make him master of the world! Can Pazu and Sheeta stop his sinister plan? 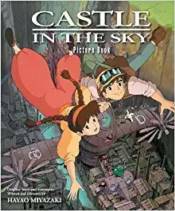 Includes scene-by-scene illustrations and character dialogue from the film.